January 2014 was rich in constitutional reforms for the North African region. The two leading countries in the region, Egypt and Tunisia, adopted new constitutions, designed to consolidate the achievements of the “Arab Spring”. Tunisia has always been considered a successful country in terms of law. Ideas of protecting human rights and freedoms have been implemented in this country in the second half of the 19th century. Thus, on April 23, 1861, Muhammad Sadiq Bey created the country’s first constitution, which included provisions found in the Founding Covenant of Tunisia dated September 10, 1857. It included inviolability of honor, person and property, equality in law as well as enterprise and trade freedom. The Constitution of 1861 clearly regulated the formation and powers of higher authorities, and their relationships. In 1881, France established a protectorate over Tunisia that lasted until 1956. After becoming an independent state, having abolished its monarchy in 1957, the state started forming a new constitution, which was adopted on June 1, 1959. In many respects, the provisions of the 1959 Constitution duplicated the French Constitution, providing the executive body, and primarily the President, with extensive powers, which in March 1975, allowed declaring Habib Bourguiba the lifelong President of Tunisia. Results of the first constitutional Jasmine Revolution were the development of the political system in Tunisia and the recognition of a multiparty system. The Constitution of 1959 carefully regulated the legal status of the person and citizen, reinforced the fundamental human rights and freedoms, and clearly regulated relationships between higher authorities. However, high level of youth unemployment (Tunisia has one of the highest rates in the world, in terms of young people with higher education – 95%), and the conservative government and its fusion with business led to a revolution on January 14, 2011. Any revolution requires a change in the constitutional foundations. Thus, in October 2011, the Constituent Assembly was convened, whose goal was to develop the text of the new constitution of the country, underlining the achievements of Tunisian democracy. 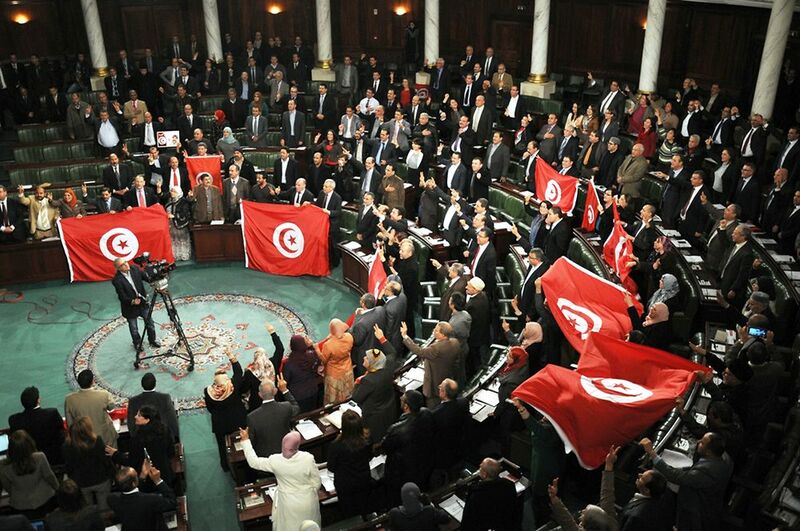 The result was the adoption of the new Tunisian Constitution on January 26, 2014. Its main achievement, of course, is a significant expansion of personal and citizen’s rights and freedoms. Particular attention is paid to women’s rights. The principle of equality of female and male citizens is proclaimed in Article 21. In addition, according to Article 46, the State undertakes to protect women’s rights, guarantees equal opportunities for men and women in all fields, aims to achieve parity between men and women in the elected government bodies, as well as to take the necessary measures to eliminate violence against women. These provisions deserve special attention, because they are often absent in the constitutions of the most democratic countries in the world. In addition, the new Tunisian Constitution pays special attention to the social rights of citizens, guarantees the right of scientific research, free compulsory education up to 16 years and the free health care. In addition, the State protects persons with disabilities from discrimination by providing the right to disability benefits, depending on the nature of the disability and provides full integration into society (Article 48). It is necessary to note that the provisions of Chapter 2 of the Constitution do not have a declarative character. For many decades, there has been established an effective mechanism for the implementation of the provisions of the Constitution in Tunisia. Therefore, these articles should be taken as a statement of current reality and confirm the pursuit of harmonious human development in Tunisia. According to Chapter 6 of the Constitution, there have been created special independent constitutional bodies, responsible for elections, human rights, sustainable development and the rights of future generations, as well as the struggle against corruption. As a result, according to the second Jasmine Revolution, the President of the country cannot hold office for more than two terms (Article 75). Thus, the main achievements of the Tunisian Constitution in 2014 should be considered its social orientation, gender equality, protection of women, the broad scope of political, personal, social, human and civil rights and the strict regulation of the relationships between government branches. Undoubtedly, the 2014 Constitution is a worthy and logical continuation of the country’s democratization policy and the worthy position of the individual and citizen in society. Despite a rather long history of constitutional development, Egypt has not reached significant achievements in this field. Egypt’s first Constitution was adopted by King Ahmed Fouad I on April 19, 1923, shortly after abolition of the British protectorate. This constitution included the constitutional achievements made ​​in the country since 1881. Despite a temporary suspension, this constitution was used until 1952. From that time on, Egypt underwent constitutional reforms: constitutions were adopted (1956, 1964), then suspended, then some constitutional declarations were enacted, until finally, on September 11, 1971, in a referendum, the new Constitution of Egypt was adopted. It laid the foundations for Egyptian society and state. Despite the fact that its provisions were more declarative in nature, it was valid until February 13, 2011. From that moment, there were again attempts to adopt a new Constitution: first, the Interim Constitution was adopted in 2011, then, a new constitution followed. It was adopted on December 15 and 22, 2012, in a referendum and signed by the President of Egypt on December 26, 2012. However, its power was suspended by the Egyptian Army on July 3, 2013, after impeachment of the President. Only on January 14-15, 2014, the current Constitution of Egypt was approved via a referendum. However, the question of its longevity remains open. The fact is that, in comparison to Tunisia’s Constitution, the 2014 Egyptian Constitution prescribes the ideals of Egyptian society, which have to be reached. In reality, there is no mechanism to fully implement the constitutional norms and declarations. Legislators described, in detail, the formation and interaction of the highest state authorities, limited the President’s power to two four-year terms (Article 140) and imposed a ban on the formation of political parties on the religious principle (Article 74). Touching upon human and civil rights, despite the abundance of rules governing political, civil, social and economic rights, these rules have only a declarative character and rather express the wishes and aspirations of the Egyptian society, which, are far from today’s reality. In particular, speaking about the health service system (Article 18) and education (Article 19) that are declared as human rights, the state is obliged to create an appropriate system and allocate money based on a GDP percentage (3% and 4%, respectively), with a gradual increase of these sums up to the world level. It should be noted that illiteracy has not been completely eliminated yet, and in Article 25, the State undertakes to develop a general plan to eliminate alphabetic and numerical illiteracy among all citizens of all groups, and to develop implementation mechanisms with the participation of civil society institutes, in accordance with a specific timetable. Women’s rights are considered in the context of the family as the foundation of society (Article 10). Again, the State, in accordance with the provisions of this article, is only committed to achieving equality between women and men in all civil, political, economic, social and cultural fields, in accordance with the provisions of the Constitution, and to take the necessary measures to ensure adequate representation of women in the Houses of Parliament, as determined by law. List of declarations of the Egyptian Constitution can take a very long time to enumerate. Practically all of the provisions of Chapters 2–4, and this is 95 articles, have no implementation mechanisms. Thus, the people of Egypt in January 2014 voted only for their dreams, which the state cannot implement at the moment. This is the difference between the constitutions of Tunisia and Egypt. Tunisia’s Constitution consists of real foundations of modern Tunisian society. Ekaterina Ryzhkova, PhD in Law, Associate Professor at the Moscow State Institute of International Relations of the RF, exclusively for the online magazine New Eastern Outlook.